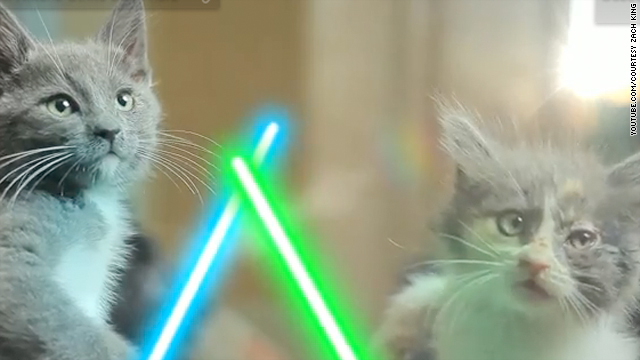 The 16 second video – which has made enough "Star Wars" fans (and cat lovers) squee since it was posted on August 25 to get over a million page views – has indeed spawned a sequel, "Jedi Kittens Strike Back." King – who plays the part of the kittens' annoyed owner in the videos – took some time away from planning what's sure to be the third of a trilogy to talk more to CNN Geek Out about the web phenomenon. CNN: So the first "Jedi Kittens" video clearly wasn't enough. King: We decided we should make a second one, maybe make a three-part series or something like that. We did the second one and it got a million views within the first three days. And we were like, this is awesome! CNN: How big of a "Star Wars" nerd are you? King: I’m just a regular fan, but George Lucas really did have an impact on me on filmmaking. I remember watching his movies growing up and thinking, "I wanna make movies like that!" And in a way I am, with "Jedi Kittens." It’s kinda funny. CNN: How much work went into these videos? King: The first video took seven or eight hours with shooting. The second video took about 24 hours to do. I created the props from scratch with cardboard, and shot the video in a few hours, and then the rest of the time was spent doing visual effects. CNN: What's next for "Jedi Kittens?" King: I can’t promise when it will be out, but I know that "Jedi Kittens" definitely has an epic conclusion coming soon, and I think people are really gonna enjoy it. Ich zweifellos sehnte sich nach einer Bestätigung entstehen Mittel, um die wir für alle einen herrlichen Beitrag zeigen wir auf geekout.blogs.cnn.com gewesen zu schätzen. Meine erweiterte Internet-Sack hat sofort mit grossem Strategien berühmt zu gehen mit meinen Freunden sowie Familie. würden wir zeigen, was die meisten von uns Besuchern im wesentlichen wurden zweifellos geheiligt zu existieren in einem auffälligen Ort mit wirklich sehr unverdünnt Menschen mit profitable Hinweise. fühlen wir uns in der Tat verpflichtet erkannt Ihre Web-Seiten sowie Verhalten dreiste um so die meisten einige mehr außergewöhnliche Minuten Feier der Masse hier zu haben. Vielen Dank, wir wieder für alle a Details. Gute write-up, I normalen Besucher geekout.blogs.cnn.com bin, warten bis die nette Bedienung, und es wird ein regelmäßiger Besucher für eine lange Zeit sein. That was awesome!! Thank you so much for this article! You absolutely made my day. Here's a shocking idea, how about you actually do some research BEFORE you post? There is a "making of" film on youtube by the makers of these videos. These kittens are rescue kittens from the pound. They both had eye infections, one was already over it, the other was still on antibiotics. They are both obviously loved by the makers of these videos. The cats paws are NOT taped together or elasticed together or anything else as dumb. Well in a way they were. They are clear pieces of tape wrapped and facing the outside so their fur wouldn't get pulled and the kittens wouldn't hurt. The "lightsaber" is actually a stick thats attached to the tape. The tape can be slipped off at any time easily and does not pull the kittens fur. Then they used special fx to create the rest. Where you see the cats "standing up", they are being held up by their owners hands which are then removed in post production before release. I don't see any evidence of these kittens being hurt in any way. Everything I see is the owners being very loving and caring toward them. I am very much a cat lover and I'd be very upset if I saw any evidence of them being treated badly. Do your research instead of believing everything you see on the net. Not News, and also not even close to Star Wars kid. Not Star Wars... Star Wars Kid, you may not remember or know about the kid who videotaped himself on a school camcorder then the next kids that checked it out took the footage and put the lightsaber effects in? That is what he is talking about, not the Star Wars Saga. bahahah so fun! kittie jedis! get that dude out of it tho, have it just be kitties! What's all this chatter about "its not news"...There are different kinds of "news"...economic news, entertainment news, international news, etc. How boring would this world be if all we talked about was crime, terrorism, natural disasters and economic ruin. Sheesh. Lighten up. I love it, already sent them to my wife. This was cute. If you want to see something truly funny place a piece of scotch tape on the bottom of your cat's feet. I caught my first jedi 34 years ago at the drive-in, and they're still catching headlines. Most impressive. Now let's see how them kitties handle a disco ball. Lasercats, ho! The force must be strong with you to catch a Jedi powerful indeed you must be. It's cute, but he tied their paws together with either tape or rubber bands, to make the video. Yeah, I noticed that too. The paws were bound somehow. Not cool. Watch the "Making of" video associated with it on YT. You'll see that they did it with the tape facing outwards so it wouldn't be uncomfortable or have anything sticking to the fur. Cute but I can't believe this made CNN. 24 hour news get desperate. You so burned that heretic. hey garret.. your an idiot.. lighten up!! Taping their paws together isn't considered funny in my book. LOL! Great video! Why must every single person on cnn shove a giant stick up their behind before commenting? You people are the most unhappy, whiny, annoying people on earth. The lillte one on the right, his little right eye looks infected. Not OK! They had better be nice to those kitties and keep them even after their 15 minutes are over. I can come get them if your going to just throw them out. Just saying. I can't tell how good or bad the video is because there is a HUGE ANNOYING AD that pops up in the middle of it, not matter how many times you've seen the video. Media delivery and advertising failure to the extreme, boys. Make sure people can view your video without the ad after the first view. Otherwise, it's hard to get a clean look at the thing. Freaking advertising. The internet is one giant freaking ad. Yeh, every since Google bought YouTube you get "Ads by Google" before everything. It's become automatic to just close the box without even reading it. Your right because free videos should pay for security, privacy, staff salaries, and hardware without having anyway to generate income. After all you would except my enjoyment of your comment in place of a paycheck right. I think people should have to pass a test to be able to leave comments on a story, blog, or article. I cannot believe the people that are putting down this guy for his cat's eye. If you would bother to read anything and do a little research you would know that they kittens were RESCUES, they had eye infections which is very prevalent in rescues and have had and are currently getting treatment for them. Instead you jump to conclusions and accuse a person of something that isn’t even happening. Quit the judgments, check your facts. Instead of jumping on this guy, why don't you jump on the people that don't spay and neuter, and worse dump their pets when they don't want them anymore. Those are the people that deserve your judgments and abuse. These cats don't look distressed at all. And this coming from my best friend who is a Vet and graduated top of her class at UC Davis. What do you do for a living besides sit and judge people? I am glad to hear that and no Idid not look it up first I just reacted. So forgive my other post. "We knew there was nothing on YouTube like that..."
Are you kidding? Isn't that like...EVERY video on YouTUBE? this is news? really CNN? I mean, really? come on. News doesn't have to be just some dry economic story, stories about people dying. People used to complain that is all it was and now people complain when a CNN BLOG reports something that happened and is popular–news, sort of. This just in CNN should close its doors because someone will complain about anything, this isn't news, thats not news. These annoying comments aren't news. After all nothing is news so therfore CNN should report on NOTHING. And there is a new study out that uses anecdotal evidence to prove that a lot of people are jerks. @ Andrew then why did you even click on the link? Did you notice the tabs at the top of the page? They say Entertainment, living, tech, health, travel, There are a lot of other things on a news site (all the news sites) then just straight Politcal, Criminal, or financial news. If you didn't know by clicking on the link "Jedi Kittens" that it wasn't a serious news story, then you have got more problems then you think. PETA is ridiculous. Even my vegan friends who are very much about animal welfare agree. If the kittens didn't go through this biting and scratching, it's OK, PETA! Why do cat people tend to be a little odd (to put it nicely)? Your right because carrying your dog in a purse or putting clothing or costumes on them is strange at all. Yeah, that's the main reason I don't get a dog. It's absolutely ridiculous to think that I have to carry a bag of $#% around. Yeah and clicking on a link about cats to complain about cat people is sooo normal and well adjusted. Jedi Kittens clearly needs more stormtroopers and Giant Tupak Lizards in the background. Time for a digital re-release! That's what I was thinking, that they should ruin it like Lucas. I've eaten a cat before. They DO NOT taste like chicken. Trust me. Sheesh, did you tug it also? Calm down, they're only kittens. You're weird. Oh great, watch all the crazy cat ppl come out to these comments board. Cat ppl scare me, they're weirdos! Yeah your normal curl back up into the fetal position and click your heels 3 times saying there's no place like home in my parents basement. Are people really arguing on how the cats are "abused" by the owner instead of enjoying the video.....PETA listen up...don't become the WBC of the animal world please. WBC is the new PETA. You are all crazy. The cats aren't being harmed here lol. What- a cat was bounced around? Boo-hoo, go slave babies being beaten by their parents and wives being abused by their husbands before you knock on this sick kittay jedi-warrior video. Back off PETA peeps. These kittayz is havin funzzz. Come on these kittens are obviously not real jedis. Jedis aren't real Jedis. They're fictional. The mind is weak with this one. Those kitties don't look too happy to me. Whoever did this – they are your pets to whom you have great responsibilities. They are not there to make you famous or serve your egos. Please explain why the right Kittie's eye and nose look damaged. Don't forget all the instances of elephants and lions who go off on their trainers who have abused them. Think before you post this stuff. It could be cute but is suspect to me. Hey catsrule,, Ever think maybe the reason the cat looks "beat up" is because he rescued it from a shelter to give it a life of fame and fortune.. you seem like a bitter neverwas to me. I was reading it all the way through and they said they adopted them so I think the Damage might have come from their other owners or they were stray at first. So, just when did you have your senseofhumorectomy? He said in his "making of" video that the kittens were rescued from a shelter and had eye infections when they were adopted–for which they were given medicine. They both look extremely well taken care of and very happy. What have *you* done lately to help stray animals besides accusing some great guys who gave these kittens a happy home of abuse? I volunteer for a no-kill shelter and it was nice to see something out there that was fun rather than just another story about abuse. Bad news can be so overwhelming that the unexpected smile feels especially good. Thanks for sharing the videos. Keep it up! Loved it! Looking forward to the 3rd installment. Zomg this is awsome 🙂 cute meows ..
Me gusats tu estilo, muy buen artículo. Da gusto leer algo así en lugar de las típicas reseñas de nutrición de consejos consabidos de las que está plagada la blogosfera. Te añado a mi lista de blogs recomendados! THIS is front page news?! What does it matter is on the front page? What makes you so all knowing that you think you know what should or should not be "Front Page News".....that was a term used for newspapers when what you put on the Front Page actually drove sales up or down. This is a website, they have so much room it's not even funny......get over yourself. Well done! Both kitties look happy and healthy (second kitty with left eye lid issue is perfectly fine in the Strike Back episode). man, the cat on the right is FUGLY and scary looking.